Brickell is an urban neighborhood of greater Downtown Miami in Miami,FL. It’s Miami and South Florida’s major financial district. Brickell contains several new and future upscale residential and financial buildings.It is known as the “Manhattan of the South,” and is home to the largest group of international banks in the U.S.along Brickell Ave. Brickell has quickly become one of the most saut out areas to live,dine,shop and have a good time. With several restaurants and bars to choose from, people have migrated here to have a good time. There are few subdivision area within Brickell. One being Marry Brickell Village which is located in the heart of Brickell and is home to many shops, upscale restaurants, bars and more. It stretches for two blocks and is the hottest area to go to in Brickell. Another are is Brickell Key which is located over the bridge from Brickell Avenue.Brickell Key is an artificial triangular island on the Miami River. Miami’s Brickell Key is small island where some of the most luxurious condos reside. These condos are comparable to the most exclusive properties worldwide.This unique triangular shaped island is also known as its own “private little paradise”. Brickell is a very diverse neighborhood and has always been the key to Miami’s growth and success. Brickell is a dynamic area that has so much to offer and it is being recognized as a leader for the next century. Living in Brickell, everything is at your doorstep! The American Airlines Arena is one of the major attractions in Downtown area which is only a bridge over from Brickell where people can enjoy watching the Miami Heat defeat their opponents or hear their favorite artist perform. Bicentennial Park is a 30-acre public, urban park in downtown Miami which offers free yoga classes and hosts trapeze classes and much more. There are several monthly events that take place here and are fun for everyone ! Right next door to Bicentennial Park is Bayside. An outdoor shopping center that is full of vibrant energy and fun things to do other then shop. At Bayside you can enjoy all kinds of stores, restaurants, live music , boat rides that take you all over the Miami area and lots of fun activities for the children such as: a small animal petting zoo, fun rides and much more. 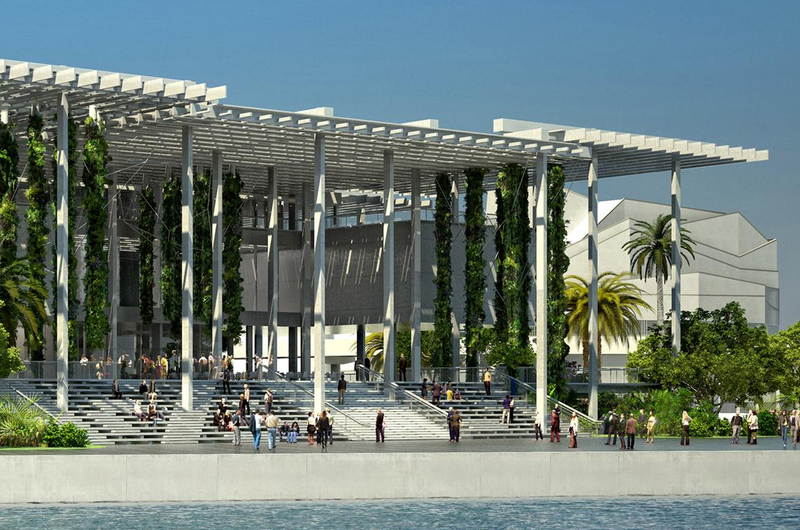 If that’s not enough, the new Pérez Art Museum Miami (PAMM) is currently being constructed right around the corner. PAMM will be an anchor of the 29-acre Museum Park overlooking Biscayne Bay and will include public gardens and sculpture installations. Museum Park, a vibrant mix of green space and cultural offerings, is Miami’s urban redesign vision for the area now known as Bicentennial Park. This vital downtown park, a catalyst for the transformation of the district, is central to efforts to strengthen Greater Miami’s momentum as an emerging global capital. In addition to the landmark new facilities for PAMM, Museum Park is the future site the Patricia and Phillip Frost Museum of Science. For the lovers of the arts and theatre, there is more then one option. Between the Adrienne Arsht Center and the Gusman Center of Performing Arts there is more then enough cultural diversity in the area. World renowned Shows, Operas, Orchestras, Musicals and much more are performed daily at these staples. And for those who love to shop, dine,dance or just have a good time, Merry Brickell Village is the one place to go! It is the main attraction in Brickell and home to several restaurants of all kinds of cuisines, shops, fitness center,grocery store,salons and much much more. Merry Brickell Village is like no other and everyone can enjoy a piece of what it has to offer. Brickell is full of so much vibrance and activity and it is only just beginning to grow and develop. Each day is full of something different enjoy to and experience which makes it difficult to get bored. One can see why Brickell is one of the most saught out places to live,work and play. Living here,you will never have to leave!